Singer / songwriter Michael Jason Frost, along with his wife Jen, join tenor vocalist Adam Elrod on this harmonious collection of uplifting southern gospel music. The project features nine songs written by Michael Frost, including "When I Could Not Pray." 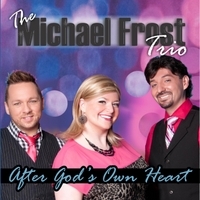 Singer / songwriter Michael Jason Frost, along with his wife Jennifer and tenor vocalist Adam Elrod, come together as The Frost Trio. MICHAEL JASON FROST grew up singing gospel music with his family in upper East Tennessee. By the time he was a teenager, he was harmonizing with his cousins and traveling on weekends across the southeast with a family band, The Frost Family. That band evolved into a vocal trio, The Frosts, that did well in the southern gospel music industry with widespread radio airplay and charting singles. The trio enjoyed success from 2002 - 2005 and earned a Singing News Fan Award nomination in 2005. As a songwriter, Michael has cuts by several of gospel music's most popular artists, including The McKameys, Dixie Melody Boys, Ivan Parker, Hissong, Heirline, The Wilburns, The Greesons, The Kirklands and more. Many of his songs have climbed The Singing News Top 40 chart. Michael was named "Songwriter of the Year" in 2007 by the Eddie Crook Company. In 2006, Michael was cast at The Miracle Theater in Pigeon Forge, TN in an original musical production about the life of Christ. Michael signed on for every season of The Miracle, where he played various roles from John the Baptist to Judas, and as an understudy to the role of Jesus. He also served as host and pre-show soloist. Michael performed in all six seasons of The Miracle, and also appeared in the theater's production of "Joseph and the Amazing Technicolor Dreamcoat" and "Exalt! A Christian Concert Spectacular." In 2009, Michael signed a recording / publishing deal with Crossroads Music / Pinnacle label. His solo CD, Sing Like It's the Last Time, was released in April 2009 through Crossroads Music and featured 10 songs written by Frost, including the charting singles "Sing Like It's the Last Time" and "Three Words, Three Nails, Three Days." JENNIFER GILBERT FROST easily captures the hearts of listeners with her vocal ability and her powerful testimony. Known to everyone as Jen, she hails from South Carolina and grew up with a passion for singing and performing musical theater. A graduate of Mars Hill College in North Carolina with a degree in music and drama, Jen went on to perform in several shows across the country in various venues and also spent some time in the theater scene in New York City. She also spent several years of her career specifically in Christian Theater. In 2006, Jen was cast at Sight & Sound Theater in Lancaster, PA, which is the largest Christian-based theater in the country. There, Jen had feature roles in the original productions of Ruth and The Miracle of Christmas. In 2007, Jen was cast in The Miracle at The Miracle Theater in Pigeon Forge, where she performed until 2011, playing various roles from Mother Mary to Martha. She was also featured in the theater's production of Exalt! A Christian Concert Spectacular which was performed twice a week throughout 2009. Jen met Michael Frost at The Miracle in 2007, and they were married there in 2009. They have one daughter. ADAM ELROD has been on the road singing gospel music on a full-time basis since the age of 17, and is known as one the strongest tenor vocalists in the gospel music industry. He is a founding member of the Dove-Award nominated trio, HisSong, with whom he toured for 13 years. Currently, Adam is touring with The Frost Trio and is also planning a solo project.